Fall hunting seasons have come to a close and many of us have a freezer full of prime wild game. I’ve been a camp cook for most of my adult life and enjoy not only butchering the game I harvest but transforming the meat and fowl into some tasty dishes. Cooking game is different from domestic meat. Wild animals have to work for a living and they are usually more muscular, resulting in tougher cuts. I recently completed curing and smoking the hams from a couple of wild hogs I harvested and I’m planning my third round of sausage making in the past 3 months. The controlled, even heat supplied by my Smokin Tex electric smoker make the task easy. Curing ham and bacon is not rocket science. It is an art that has, in large part, become lost through the years. I remember my dad ‘sugar curing’ hams and bacon when I was a kid. He always raised three or four hogs and butchered them in the winter. I am sure if feral hogs were as plentiful back then as they are now, he would have taken his pork from the woods rather than the pig pen! Once my pieces of pork are cured, I simply wash them off in cold water to remove the excess salt, and then place them in my Smokin Tex electric smoker set at 160 degrees for an hour of heavy smoke. Next, I wrap the pieces in foil and allow them to cook about 3 more hours. The meat will reach 160 degrees well before the 4 hours but the added cooking time tenderizes the cured meat. The foil wrap keeps the meat from getting too smoky. I then wrap the cured pork in foil, place it in the freezer and use as needed. The first time you enjoy a breakfast of pork you cured at home, eggs, hashbrowns and biscuits, you will be ‘hooked’ on curing meat at home. You can make ham at home from cuts of domestic meat you purchase at the grocery just as easily. Catch fresh pork shoulders on sale, cure and smoke them and you turn a $2 per pound cut of meat into a delicacy that would cost three times what you paid for it. I also use my Smokin Tex to smoke cured duck and goose breasts (you cure these smaller cuts the same way used for pork hams), they will cure in about 24 hours in the refrigerator. We really enjoy quail, chucker or pheasant smoked on the electric smoker. Give this recipe a try, if you don’t have upland birds on hand, Cornish hens work just fine: Sprinkle your favorite dry seasoning on the whole birds, then wrap them with bacon strips and secure with toothpicks. Place each bird on a piece of heavy duty aluminum foil and smoke with pecan or fruit wood such as apple or plum for about fifteen minutes. Next, wrap the birds in the foil and allow to cook at 225 degrees for about an hour. Uncover the birds and allow to brown during the last ten minutes of cooking. I use my electric smoker a great deal for cooking larger cuts of meat. The Smokin' Tex Model 1400 I smoke with can handle about 30 pounds of meat. The model 1100 accommodates 20 pounds, which will easily handle most meat smoking tasks. The great thing about barbequing (smoking) with electricity is the fact that you load the meat, put the wood inside the smoke box, close the door, set the thermometer and walk away, no staying up half the night feeding wood to a wood fired smoker. I’ve cooked many wild hog hams and venison hams through the years. I often use an a needle and inject hams with a blend of butter and my favorite dry seasoning or Country Bobs, but pre-mixed injectable marinades are available. I usually put these larger cuts on to smoke a couple of hours before I go to bed in the evening and let them cook all night. With the thermostat set at 200 degrees, the meat cooks slowly and tenderizes nicely by morning. I leave the hams uncovered for a couple hours and smoke them heavily with hickory or pecan wood, then wrap them so they will remain moist during the cooking process. It matters little if the bigger cuts are left in the smoker 12 hours or 18, at the low temperature; they just continue to get more tender. I usually get 1 inch thick pork chop cuts from the wild hogs I harvest. Slow cooking in moisture is very important to making these chops tender. In years past, I’ve tried to simply grill these chops over charcoal or once on a gas grill. They were safely cooked at a temperature above 160 degrees but, tough as a boot. These same chops, when smoked for 15 minutes or so, then wrapped in foil and slow cooked a few hours with BBQ sauce are 'fall off the bone' tender and flavored through and through. Sausage making at home is very easy. I used to stuff sausage in small ‘link size’ casings, using a sausage stuffer, then smoke them. I’ve found it much easier to use the larger casings and simply pack the raw, seasoned meat into the larger casings by hand. It’s easy to get too much smoke on the sausages, that’s where the Smokin Tex is really worth it’s weight in gold. Simply load 3 or 4 ounces of wood into the fire box and let the sausages smoke. This small amount of wood will not overpower the flavor of the meat with wood smoke. Most sausage seasoning packs contain cure which allows slow smoking at long temperatures without fear of the meat spoiling. Make sure and mix the ground pork, venison or beef well, then hand work the seasonings into the meat and allow to chill (cure) overnight in the refrigerator. Hopefully these tips will help you transform your game meats into the makings of many tasty meals. 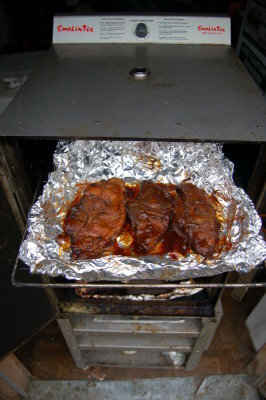 For more information, check out the forum and recipes at www.smokintex.com. Remember, you will need seasonings for curing your bacon, hams and sausages. Frisco Spices (www.friscospices.com) has everything you’ll need, including an onboard game cooking guru, Mike Pullen to answer any questions that might arise.